It’s no secret that I like my wine, but when drinking hard liquor or making a cocktail, vodka is my spirit of choice. I was introduced to Re:Find Distillery when co-owner Monica Villicana kindly sent me a sample of her Re:Find Barrel Finished Vodka. (Click the link to read the full review. SPOILER ALERT: It’s awesome). So, when I made my pass through Paso Robles, home to Re:Find Distillery, I had to pop in and see this operation from the inside. About Re:Find: Monica and Alex are winemakers first; they’ve owned and operated their eponymous winery for over 20 years. Their small 13-acre estate is planted to an eclectic mix of Rhone-meets-Bordeaux grapes: Cabernet Franc Cabernet Sauvignon, Grenache, Merlot, Mourvedre, Petit Verdot, Syrah and Zinfandel. Working with these thick-skinned grapes means dealing with the post-skin contact settlement, pre-fermentation run-off. To break it down, after the grapes are picked, destemmed (or not), and pressed, the juice will sit in contact with the grape skins (this is what gives the wine its color and texture). After a time, a certain amount of the juice is bled off, which will increase the intensity and concentration of the red wine. The run-off, the discarded juices, is called saigneé (French for “bleed”). 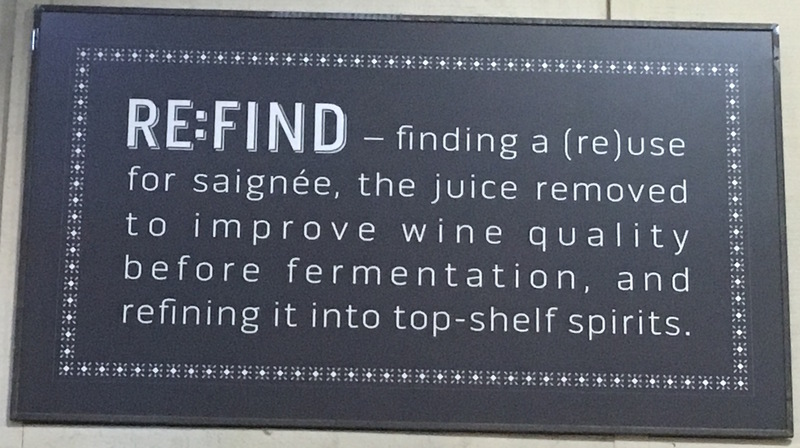 In many cases the bleed off is either poured down the drain, used as “topping wine” to fill the ullage during storage, or is used to make rosé wine (the saigneé method). The Villicana’s saw this run-off as wasteful and thought about ways to eliminate their part in, literally, throwing food down the drain. At one point, Alex says, he even experimented with not bleeding off his red wine (Note to winemakers: Not a good idea). And why not just make their own rosé? While the Villicanas have had rosé in their program since 2003, they much prefer making a purposeful rosé: “We choose to pick earlier during the harvest for our rosé,” says Monica, “Earlier in the harvest, the grapes have lower sugar level and high acidity — both of which are critical for rosé.” Often, when using the saigneé method, winemakers will need to add acidity back in to the wine because the grape’s juices will be higher in sugar and lower in acid (since they’re using the juices from fully ripened fruit). And, if you haven’t gathered yet, the Villicanas are all about keeping things as naturally stream-lined as possible. 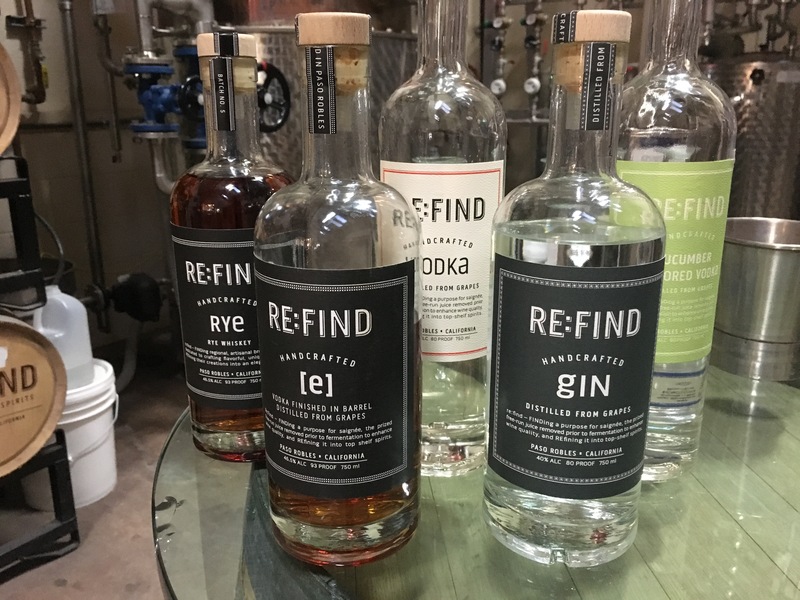 So, through research, visits to other wineries, and distilleries, Alex realized that really anything that can ferment, can be distilled — potatoes, grains, and (oh, hey!) grapes. It didn’t happen overnight — in fact the Villicana’s went through a lot of trial-and-error and mad-scientist-like lab experiments. But, today, Re:Find saves the saigneé not only from their own winery, but from over 20 other wineries in the Paso Robles wine region; they’ve saved about 50 acres of vines,150 tons of grapes, 25,000 gallons of juice — just within the last two years. “We like to think of ourselves as Paso Robles’ distillery,” Alex says. And they are — not only are they saving the juice of fellow winemakers, Alex and Monica source the fruit, vegetables and botanicals for their infused sprits from neighboring farmers as well. Re:Find truly embodies the Spirit of Paso. The Re:Find Line: Ok, let’s get down to the good stuff: the booze. You can read more about Re:Find Barrel Aged Vodka in my previous post, but here are a few other “must-try” goodies from Re:Find. Re:Find Vodka – The most basic of the Re:Find offering and, to me, it’s the most delicious. Smooth, almost creamy on the palate, you’ll find that this vodka has a background floral aroma and an aftertaste reminiscent of fresh fruit. Recommended cocktail: None. Drink this baby on its own and love it for what it is. Cucumber Infused Vodka: If you’re at the Paso Robles farmer’s market and can’t find any cucumbers, chances are Alex bought them all. That was actually true until the farmer kindly planted the Villicana’s their own block of cucumbers. The cucumber infused vodka is made with fresh cucumber juice added to the vodka during the distilling process instead of water. While the texture of the vodka remains the same, the cucumber flavor is full on. Recommended cocktail: Simply mix 1/2 oz of cucumber infused vodka with 11/2 oz plain vodka, add a squeeze of lime, shake, and pour over 3 or 4 ice cubes. Re:Find Limoncello – This traditional Italian liquor (to my) palate just too sticky sweet. Not the way the Re:Find couple makes it. The zest (and trace amounts of pith) are soaked in the distilled spirit for 2 to 3 months. The final product uses half the amount of simply syrup called for in a traditional recipe but a bit more alcohol. The result? Again, a smooth mouthfeel, but a flavor that’s more tart than sweet, celebrating the lemon zest rather than the juice. The increase alcohol adds a warming affect both to the tongue and the body. Recommended Cocktail: Traditionalists and skeptics alike, rest-assured you can drink this straight, but if you wanted to add a little club soda and a fresh squeeze of lime, you’ll have a grown-up 7-up in your glass. Re:Find Gin I was surprised I enjoyed this one too, as I’ve admittedly only had cheaper gins mixed in abhorrently “girly” drinks. Turns out, gin is vodka, distilled to a lower temperature and infused with botanicals (traditionally juniper). Re:Find gin has a bit of a harsher mouthfeel, it’s a bit hot as opposed to warm, but it makes up for it with the eclectic mix of potpourri lingering in the back of the palate: lavender, rose petals, even hints of rosemary. It’s beautiful. Suggested Cocktail: Don’t ruin this with a tonic. If you must blend this gin, do so with club soda and an edible flower garnish. Otherwise, like the vodka, enjoy as is — on or off the rocks. Re:Find Rye – The one product not made from grapes, Re:Find rye is made from non-fermented beer sourced from a local brewer. (Inside Info: Alex and Monica have actually planted their own wheat and are looking forward to making their first batch of 100% estate grown rye whiskey.) The palate of this rye starts out smooth on the tip of the tongue, quickly moving towards a prickly heat mid-palate. The oak-aging on this provides a distinct fresh-cedar scent with a fun background essence of a nutty-like aroma. Suggested Cocktail: In a nod to my partner in wine crime, I’ll suggest the Briscoe house cocktail The Ginger-Jack made with 2 ounces of whiskey blended with 6 ounces of diet ginger-ale (Add a Stacy-twist: sub 2 ounces of ginger-ale for 2 ounces of diet cranberry juice). More Info: Re:Find also makes seasonal liquors. On a recent visit, the fermented fruit of choice was kumquat. But Alex and Monica assured me that their house is filled with jars and jars of different ingredients soaking away in their vodka. The possibilities are as numerous and varied as these two’s imaginations. BriscoeBites officially accepts samples as well as conducts on-site and online interviews. Want to have your wine, winery (or distillery!) or tasting room featured? Please visit the Sample Policy page and then Contact Me directly. Cheers! not a hard alcohol drinker anymore….but kinda cool how they re-purpose the saignee…Paso really is a neat place…another excellent read. JUST LOVE SEEING THE EXPANSION OF SUCH A GREAT WINERY AND DISTILLERY. HOLDING THE BEST OF THOUGHTS ON YOUR NEXT EXPANSION ” THE FOX “.